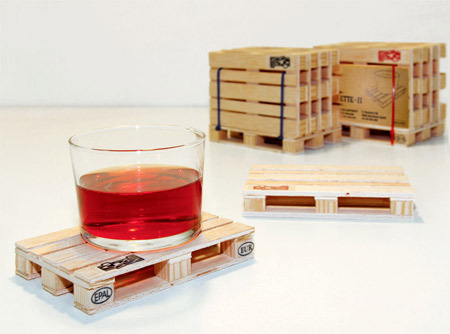 These coasters are made to look exactly like industrial pallets, right down to their quality stamps. 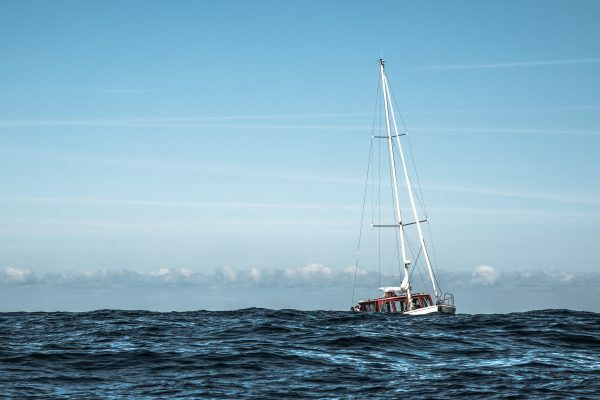 Stan was happy and completely oblivious to the dangerous conditions. There were heavy drinks being hoisted and lowered all around him, yet he always felt perfectly safe. Then Stan got splatted by a giant pint. Now the only thing he can do is protect your table top from tea and coffee stains. 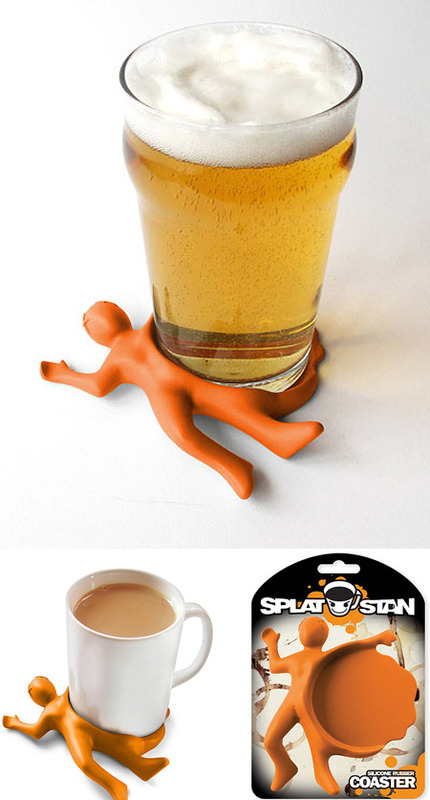 He was never the smartest fellow, but now he's a clever coaster for your mugs and glasses. 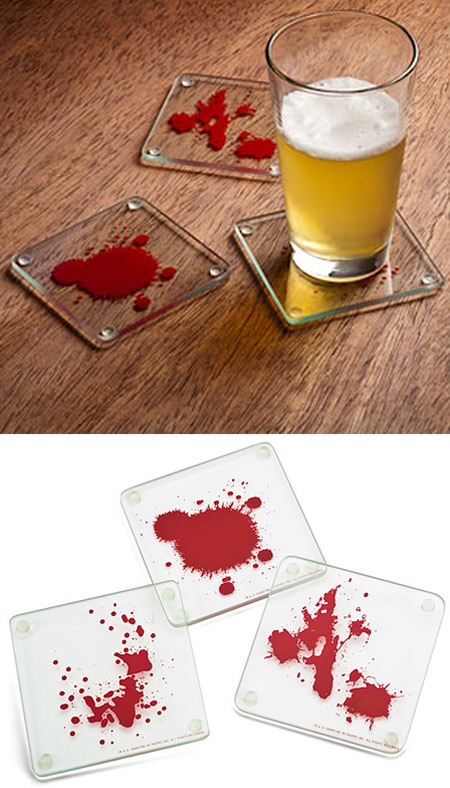 If you're a fan of Dexter, serial murder, blood spatter, or just clean coffee tables, you should get your hands on this set of coasters. 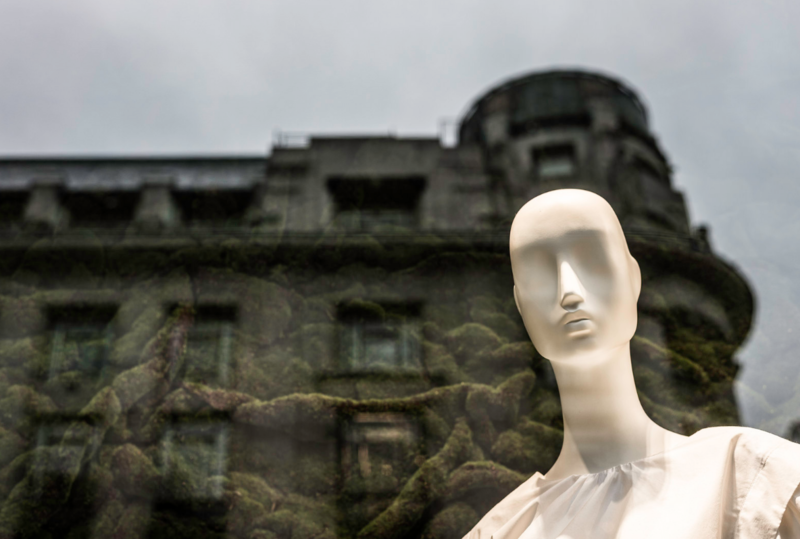 They're made of sturdy clear acrylic with various blood spatter patterns printed on them. Paper Coasters by Japanese designer Terada Naoki. 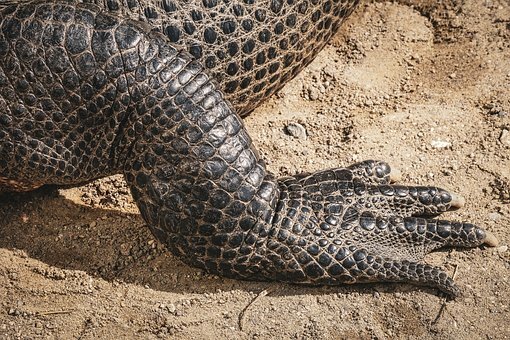 You will be delighted with the delicate profiles, the shadows they cast, and how they can be stacked on top of each other to create more elements. 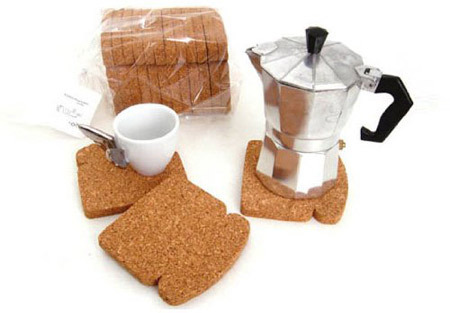 These toast coasters are a play on words, shapes, and materials. The high quality natural cork does indeed look something like toast, and protects your table surface from moisture and heat. 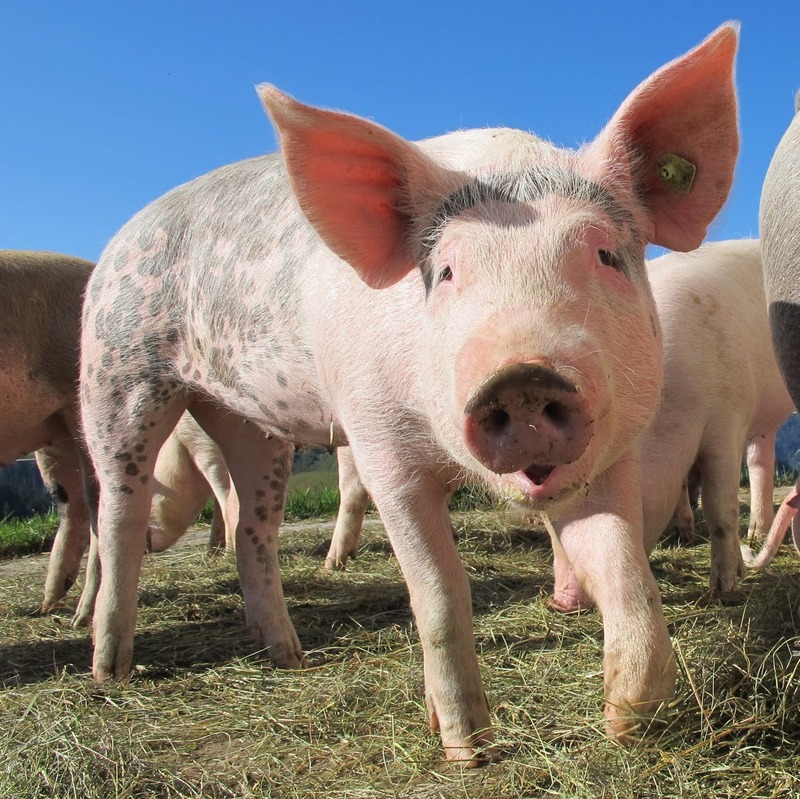 This is a great hostess gift, sure to spark conversation. Suitable for cocktail hour, the breakfast table, a Bloody Mary, or a steamy mug of hot chocolate. 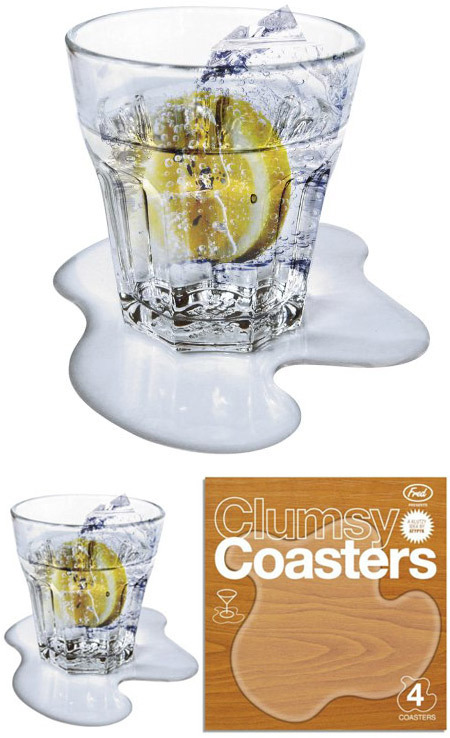 Protect a wood tabletop from water damage caused by beverage spills or condensation, while eliciting chuckles from guests, with this set of four Clumsy Coasters. From the comedic minds at Fred and Friends, each Clumsy Coaster resembles a small pool of water. Whether you call yourself a kid from the 80's or the 90's, there is no possible way you could have avoided a Rubik's Cube at some point in your life. 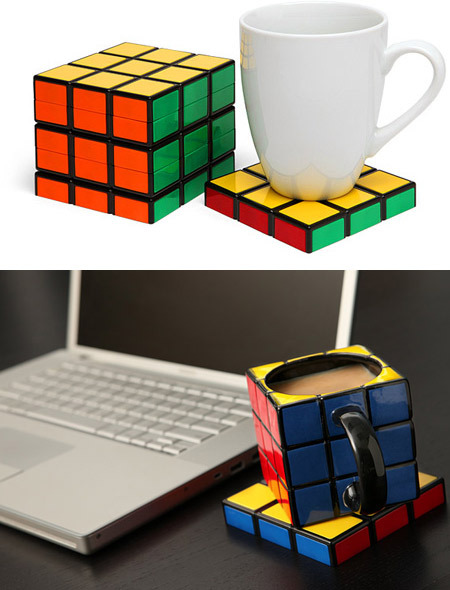 So what better way to show your endless appreciation for the retro Rubik's cube than resting your beverages on these funky colourful drink coasters? When stacked together these coasters resemble a mouth-watering all-American hamburger with the works. 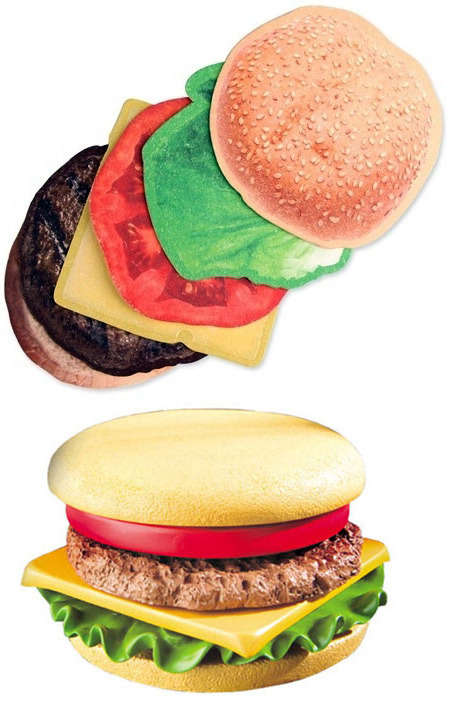 Set of 6 coasters include lettuce, tomato, cheese and a hamburger patty sandwiched between a seeded bun. 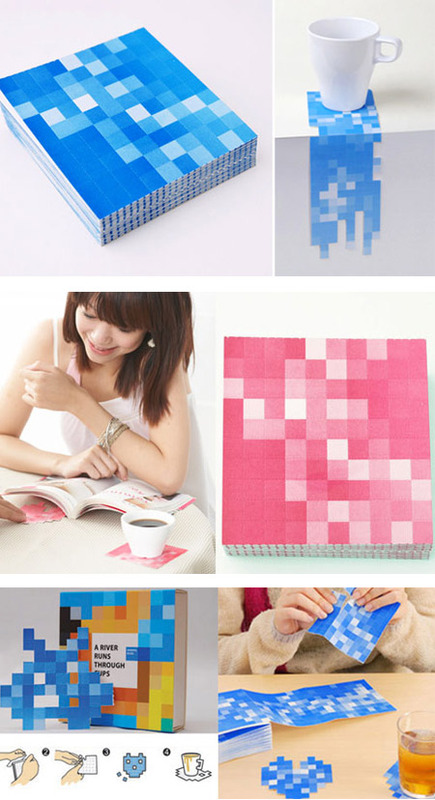 Reusable coasters made from durable, recyclable cardboard. 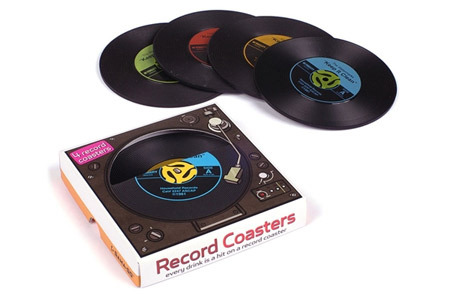 Enjoy this set of 4 silicone Record Coasters every time you drink your favorite hit beverage. They'll certainly put a new spin on protecting your furniture. Don't forget to take a close look at the band and the song on the coasters. 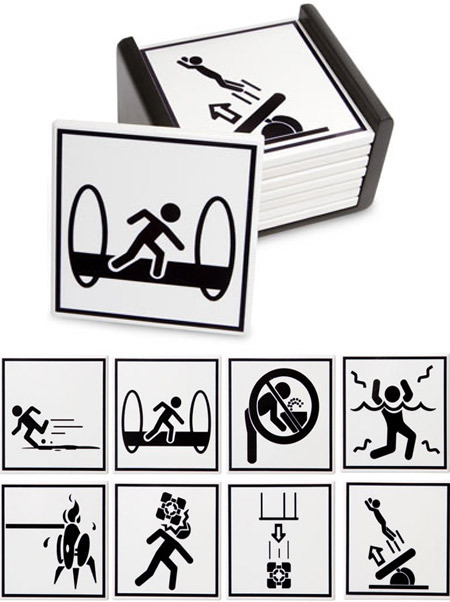 Funny Portal 2 warning sign coasters, which may serve as an ominous presence in your home for careless visitors who leave rings on the furniture. 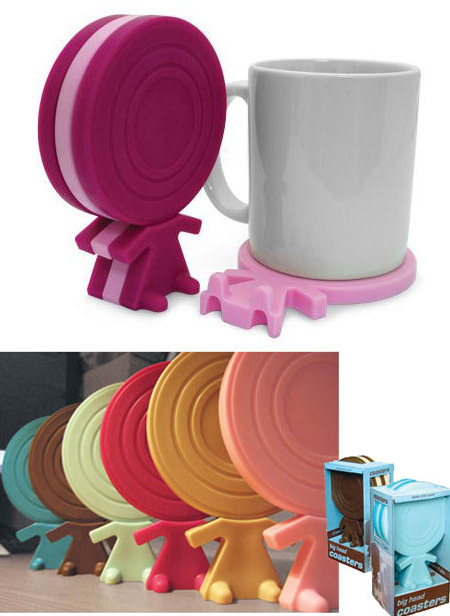 These big head coasters are always ready for your tea or coffee. Flop them down & put your drinks on their big heads. 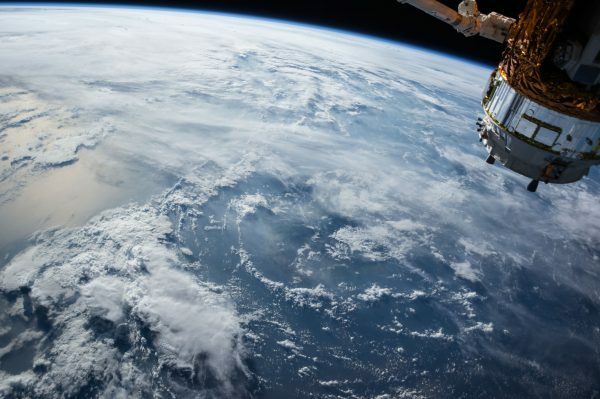 When not in use, stand them up or just leave them lying down. 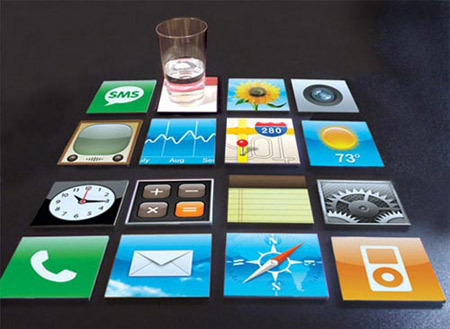 These fun coasters are based on the iPhone's home screen icons, and come in a set of twelve. 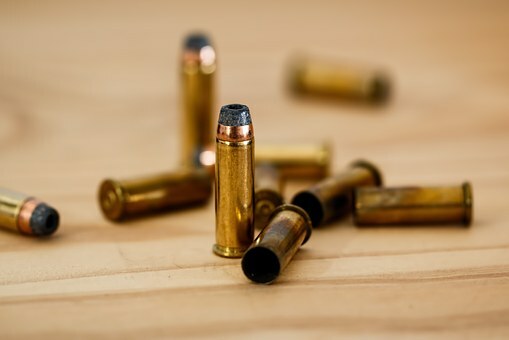 These will look great on your desk, next to your Mac. These cool coasters, created from scrabble letters, can be customized to create words of your choice. 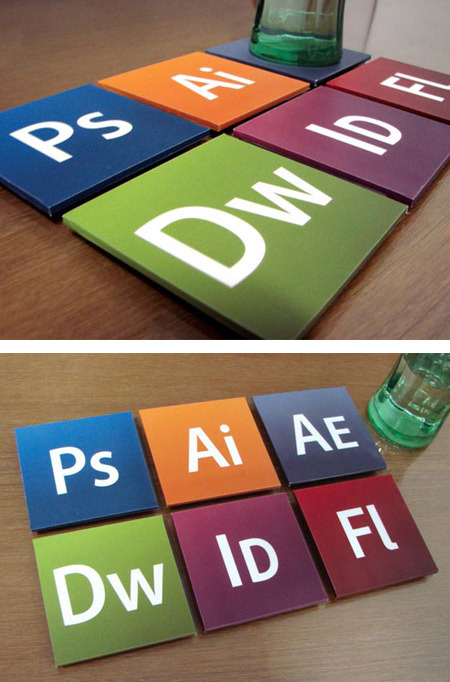 A set of six coasters for designers. It is called the Designer Set; the coasters are actually the icons for the famous Adobe software which includes Photoshop, Dreamweaver, After Effects, InDesign, etc.